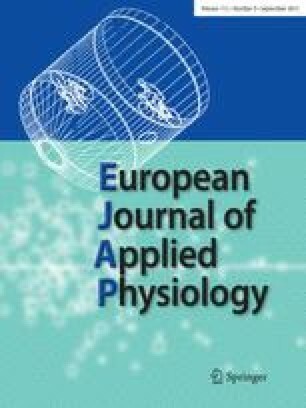 The purpose of this study was to examine using 13C-magnetic resonance spectroscopy whether muscle glycogen (Gly) utilized during a simulation of a fatiguing soccer match followed by repeated sprints would be resynthesized during the next 24 h while players consumed their habitual diet. A group of 12 elite young players [mean age 17.5 (SD 0.8) years, mean body mass 68.9 (SD 6.6) kg, mean height 177.0 (SD 5.4) cm] participated in the study. Average muscle Gly content before the simulation was 134 (SD 16) mmol·(kg wet mass)–1 and decreased during the test (P<0.001) to 80 (SD 29) mmol·(kg wet mass)–1. The value had increased (P<0.01) to 122 (SD 33) mmol·(kg wet mass)–1 24 h later but it was not significantly different from the value obtained before the soccer test. Dietary analysis of the food intake during the 24 h after the running test revealed that players consumed an average of 2,681 (SD 970) kcal·day–1. Mean daily protein, fat, and carbohydrate (CHO) intakes were 85 (SD 29), 99 (SD 44), and 327 (SD 116) g, respectively. The mean amounts of CHO intake normalised to body mass were 4.8 (SD 1.8) g·(kg body mass)–1. In conclusion, the results of this study showed that despite a CHO intake of less than 5 g·(kg body mass)–1 the habitual diet of soccer players might be sufficient to replenish in 24 h the muscle Gly utilized during soccer specific performance. However, cumulative deficits of about 10% in Gly replenishment as found in the present study might provoke decrements in performance. Thus, players should pay attention to their habitual diets and add more carbohydrates to replenish their daily deficits and perhaps increase their basal levels of intake.